With global tensions rising during the Cold War, Topps (under the name Bubbles Inc.) tapped into those fears with one of the most iconic trading card sets of all-time. 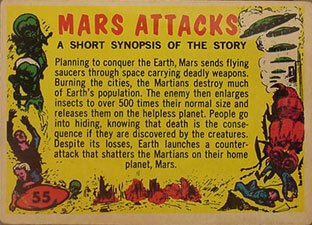 Mixing horror, comedy and sci-fi, 1962 Topps Mars Attacks tells the story of a Martian invasion. 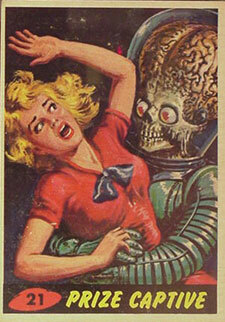 Featuring artwork from renowned pulp artist Norman Saunders, 1962 Topps Mars Attacks created a ton of controversy upon its release. Many of the cards feature gore that was extreme for the period. Some would argue some of the cards are extreme, even by today's standards. 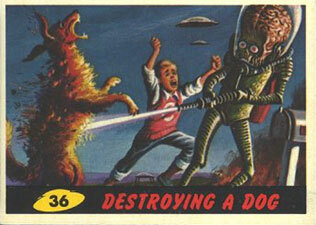 One particularly controversial card depicts an alien blasting a helpless dog. At least among parents and teachers. Kids ate them up. Their taboo nature is part of what made them so iconic in the first place. 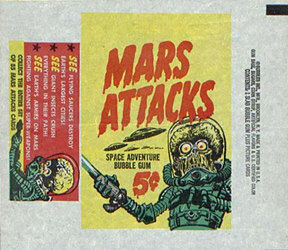 1962 Topps Mars Attacks has a total of 55 cards. As with most sets from the era, the first and last cards carry a premium as they were often the ones to get the most wear and tear. The final card in the set is also the set's checklist. Unmarked copies are very tough to come by today. 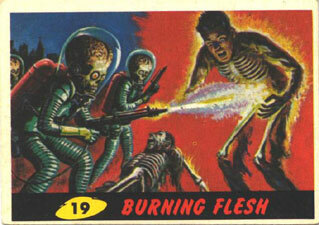 I have some where in the house a full set of Mars Attacks 1962-1964. I see on ebay that some cards go for �10.00-�15.00, what is a full set worth and are there collectors out there who would want to buy a full set. 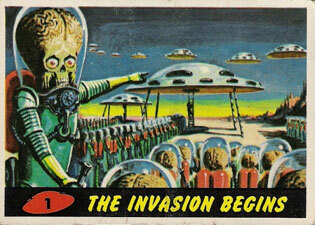 I have about 35 cards of Mars Attacks that I bought as a kid. Not pristine but not folded – just rounded corners. My kids tell me I should sell them but when I take them to a card shop they offer me next to nothing even though they are drooling over them. I am not a collector so they just sit around in a closet. What is the best way to sell these? Michael Sweet � If you’re able to, take them to a card show or comic store where you can get a second opinion. You could also see what similar condition cards sell for on eBay and perhaps list them there or on a site like Craigslist (eBay would give you a global reach). Charles Restivo � A lot would depend on the condition. They could range from a few dollars to, potentially, several hundred if graded by PSA, BVG or SGC. I have a collection of PSA graded cards I need to sell soon due to financial issues. Is there an average that the purchase price should be in comparison to PSA value? Paul Scholtes � It would likely vary from card to card. The best place to check would be eBay completed auctions. I have most of this set from my early days. Excellent shape. Missing 15 cards and have many doubles. Any like person in the tri-state area (NY-NJ-CT)?